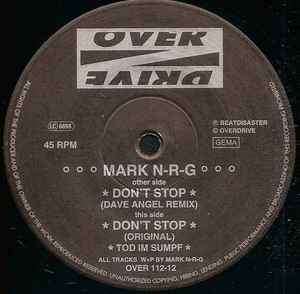 The Dave Angel remix on this is wicked! This fully shows Dave's awesome studio skills and why he's one of the worlds funkiest producers - definitely my favourite techno artist. Rhythmically, this is almost as tight as listening to Charlie Parker's Be-Bop band. He brings real elements of Jazz/Funk and crosses them over into accessible dancefloor firecrackers. I never liked the original of "Don't Stop", it just sounds wrong to me. Dave's remix is basically a complete make-over. The only thing he retains is the simple vocal but he makes much better use of it. Starting off with some funky percussion it kicks off into a mighty groove with some funky little guitar licks and a shuffling b-line. The percussion kicks in again and then the track really takes off - it flys! I also love the wicked hi-hats which work like razor-sharp incisions. The best way I can think of describing what dancing to this is like is "air-juggling!". It goes crazy at the end keeping the percussion but bringing back the stuttering, filtered vocal to create a wig-out frenzy! I first heard this on Dave's "39 flavours of Tech-Funk" CD and I instantly decided I had to have this one on vinyl. It proved to be more difficult to track down than I thought but I finally got my hands on a copy through Ebay for £2.95! Best £2.95 I've ever spent! TUNE!! !